Like many of our clients, Don Archer was a subscriber to the blog for years before we got a chance to work together. 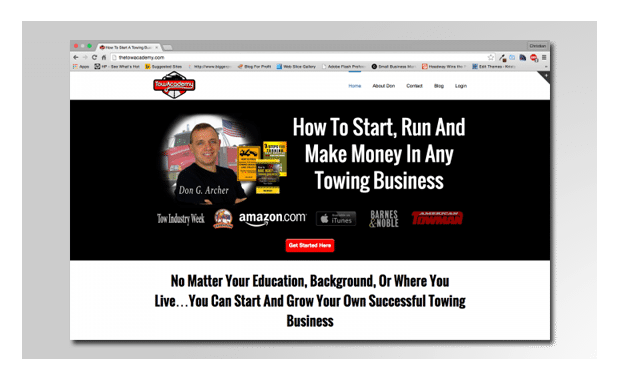 When he approached me with the tremendous opportunity to help him spread the work about his books, his training course and all the published he’s been up to in the towing industry, there was no way I could say no. Don has proven himself in his business for many years and is now in the process of sharing his insights with others. I can’t ever get enough of this kind of thing. It’s truly inspiring seeing him putting the work in, and I’m honored we get to provide him with tools and consulting to help him grow his business to totally new heights.